Wow, some more sewing for me. 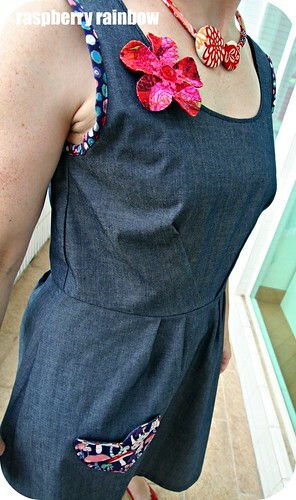 Yes, I finally made the Lisette Passport Dress for myself, I have had the pattern since early March. I love this one so much more than the Lisette Continental Dress that I made last month. To be honest, I have hardly worn my Continental Dress. The sizing, for me, was again all over the place. I adjusted as I went along, taking some length off the bodice and tapering the armholes, as they were gaping. Next time, and I am sure there will be a next time, I will remove 1cm from the bodice horizontally, as the bodice is still a little too big on me. I noted all my changes on my pattern pieces so next time it will be much quicker and easier to make. I used a light weight, denim-like fabric that I found at the fabric street market in Sham Shui Po. It is a great fabric to dress up, I knew I wanted to add a pocket and use a different fabric for the armhole. It is nice and light, perfect for the warmer weather in Hong Kong now it is summer. I can add a skivvy and tights and wear it in winter too. Here's all of me, feeling like a dork posing for photos. I'll definitely be making this dress again. First, I have these two other patterns I want to try. 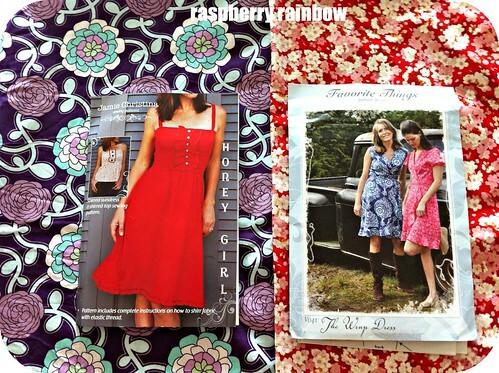 When I decide which dress I like the most, I'll be making some out of these fabrics that I love. Happy Creative Space Day to you. What are you making/baking/crafting today? * Flower brooch made by Cam from CurlyPops. ** Necklace made by Lauren Williams. I love it! And it looks great in the denim with the coloured trim and accessories! Love your dress! You're so right about it being perfect for summer and layering in winter. You can't go wrong with that style and fabric. Cat the dress is gorgeous and you look beautiful in it! I love the denim with the trimmings! Looking forward to checkint out more of your awesome creations! What a great dress! 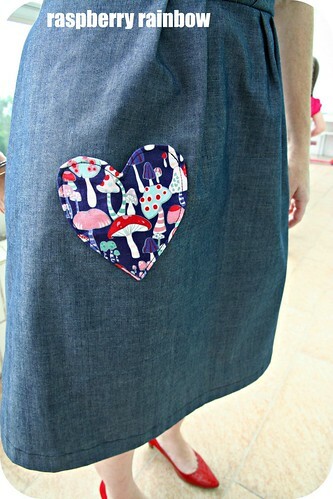 You did a fabulous job - I love the little toadstool heart on it! Looks great, I and I agree with you ~ I like this one more than the continental dress. Love it! Great job & love the decorative touch! Love the denim, doesn't it look great. My vote is for the wrap dress next! What a cute dress, it turned out well. So nice to find a style you know you'll wear again and again. It looks stunning on you Cat. Great to get a glimpse of your apartment too! gorgeous little frock, well done! Getting patterns just right is always a trial and error thing --- However when you have cut the pattern to bits and got it to fit your bits Wow it makes a difference. My girls arrive on Monday .